Beginning at 2018-07-17 10:39:17 Pacific, our upstream provider had a partial network outage in their Chicago data center. After determining that the API and UI proxy could not talk to the backend endpoints, we started the recovery plan of moving the proxy’s IP to a hot spare proxy. However due to maintenance blocks in our upstream provider’s system, we were unable to make changes to the IP allocations. After 11 minutes, network connectivity was restored. Mailsac has added a new spamminess indicator in the API. New messages will have a spam property that’s a score between 0.0 and 1.0. 1.0 indicates a high likelihood of spam. The system will get smarter over time. The main component of spam detection is a time tested approach called Naive Bayes Classifier. The core of the code is open source at github.com/mailsac/spam-classifier, though a little special sauce is applied, too. This classifier library is ready to use and includes a simple API server and a terminal training tool. In the works are additional spam classification projects using three different deep learning techniques: random forest, a long short term neural network, and a combination recurrent network + liquid state machine with spike dependent plasticity. The goal is to open source the useful pieces of the coming spam classifiers. On-Premise Mailsac now comes with the Dockerfiles and docker-compose.yml to get up and running in seconds using Docker. Each Mailsac microservice can be run independently with Docker. A convenient Makefile is included alongside the Dockerfile in each service, with a sample task for running in docker (make docker-run). docker build -t mailsac/frontend . docker build --no-cache -t mailsac/inbound . A sample docker-compose.yml file is also included. As a result you can have a fully running set of Mailsac services without even deploying it, in seconds. It should serve as a good starting point for understanding how the services talk to each other, and setting up your own deployment using pure Docker, Docker + Ansible, or an orchestrator like Kubernetes. frontend_1  | No YAML parser loaded. Suggest adding js-yaml dependency to your package.json file. mongo_1     | 2018-03-11T23:20:13.337+0000 I -        [initandlisten] Detected data files in /data/db created by the 'wiredTiger' storage engine, so setting the active storage engine to 'wiredTiger'. mongo_1     | 2018-03-11T23:20:16.481+0000 I CONTROL  [initandlisten] ** WARNING: Access control is not enabled for the database. mongo_1     | 2018-03-11T23:20:16.481+0000 I CONTROL  [initandlisten] **          Read and write access to data and configuration is unrestricted. The original Ansible based server deployment scripts are still included. After a few requests for Docker, it was decided to make it easier for prem customers to run themselves. Both Docker and non-Docker Ansible deployments will be supported for the foreseeable future. The VPS host which handles the Mailsac database servers is having a routing issue, and most of the microservices are unable to contact it. We are in direct communication with the our support rep regarding this issue and expect it to be resolved ASAP. This is a full outage. We apologize for the issue and will be working to minimize the likelihood of this happening again. Mailsac’s database, for caching and data storage, is MongoDB. Without the database, everything grinds to a halt. MongoDB supports configurations for high availability (Replication with Automatic Failover). Having all nodes of the database hosted in one provider’s network has proven to not be sufficient to prevent outages. In this case, a router within the hosting company’s network failed, which caused none of the MongoDB nodes to be accessible to the networks of the other hosting companies. We will take some time to change that configuration. In the event one or two instances went offline, or even an entire region of an upstream host, Mailsac should not go down as long as the database was still accessible to the API. Obviously that was not the case here. The solution will be to add a Secondary Node and Arbiter in different networks. Message metadata will now include pre-parsed links. This enhancement should make automation even easier. then parse the contents and search for the link. This feature should save you a roundtrip to the API and let you not worry about properly parsing HTML links. For about 15 minutes (8:13 am – 8:27 am PDT), our API was flooded with traffic due to hundreds of thousands of email attempts from 4 IP addresses. Nearly all emails were received, but HTTP requests for the API and UI frequently timed out. We do not know the percentage of requests that timed out, but it was quite high. The API is load balanced and only one API was timing out frequently. We blocked the bad IPs immediately upon seeing traffic logs (~8:19), but because our custom IP blocking service relies on the API to fetch the blacklist, and the API was not fully responsive to HTTP on one leg, it took a while for the changes to propagate to all five inbound SMTP servers. A LRU caching layer, active on each API, was added recently. Since email contents are stored separately from the database and every other microservice, many API requests will get faster. We expect faster response times for recently received messages, messages that are requested repeatedly, and any API request where the message is re-parsed in-flight. Mailsac stores metadata about every message in MongoDB. In the interest of saving disk and RAM, the full email contents are stored across file servers. When a piece of the email is requested via the API, the full file is fetched and parsed into the desired format. Believe it or not, for Mailsac, CPU is far less resource constrained than disk and RAM, so this trade-off makes sense. For example, when the email headers are requested, the API begins fetching the full message from the file server, parses the SMTP package, formats the headers, and sends them to the client. Fetching attachments is similar – when an attachment is requested, the API gets the original email from the file server where it is stored, extracts the attachment, and transfers it to the client. This process involves a lot of disk IO and network latency. With the LRU cache, we seeing 80 ms – 600 ms faster requests, and the cache is used on about 45% of requests that re-parse the email. Until now, all transactional messages sent through the Mailsac API only allowed text. With the latest release, the API supports HTML and attachments. Additionally supported is sending an entire raw SMTP message over the REST API. You can provide full HTML in the html field when doing a POST /api/outgoing-messages. This was not possible in previous versions of the API. Attachments can be sent and linked into the html by including an array of attachment objects in the attachments field. Persisting received headers is now possible – send a single string or array of received headers. This allows you to receive SMTP in your application, pre-parse it, and pass along received information. If you want to test SMTP parsing or have an application that generates raw SMTP messages, put the entire SMTP contents into the raw field when doing a POST /api/outgoing-messages. 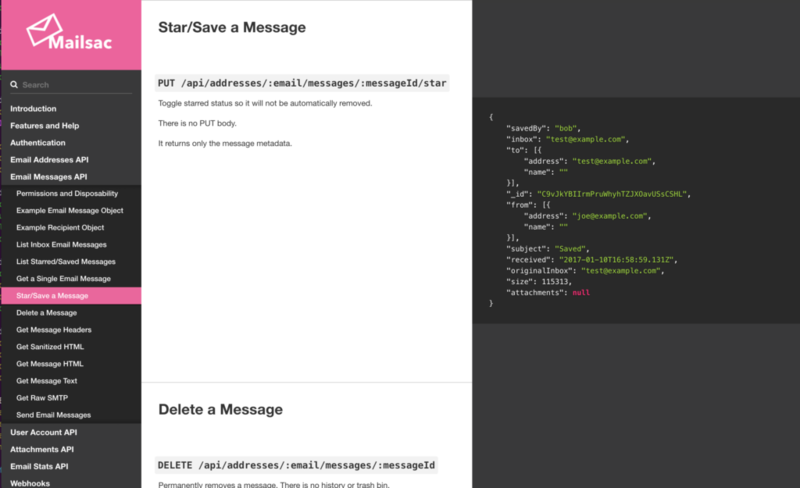 Mailsac will parse the headers, text, HTML, and attachments, then deliver it for you. All other fields will be ignored when you send a raw message. Effective today, for private email addresses, customers can send outbound email through Mailsac using any email client. Sent messages are counted against the account’s purchased outbound sends, like the previous send methods (website sending and API). Outbound SMTP settings are similar to the existing POP3 settings. The API documentation received a fresh new look using a fork of the popular Slate docs framework. API endpoints should be easier to navigate. Many request and response examples were added. Endpoints for downloading attachments are easier to find. In the coming weeks there will be updates to the docs for the SMTP Web Socket API and the Webhook API, including new examples and guides.